China Buys Gold, Gold Price Sinks! Did you really expect the People's Bank of China to make you rich...? 'CHINA BUYS GOLD and gold prices sink!' wasn't supposed to be how this whole China-gold-thing panned out, writes Adrian Ash at BullionVault. 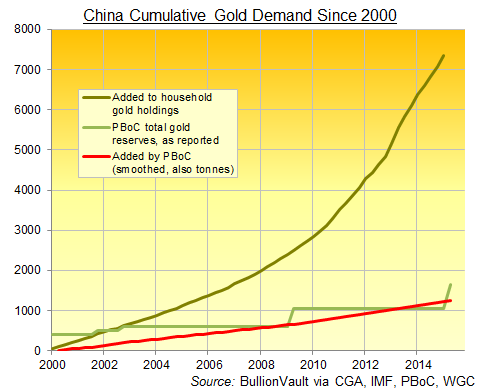 But here we are...with an additional 604 tonnes of gold purchases announced Friday by the People's Bank of China since its last revision in 2009. Yet world gold prices sank over 4% on Monday to hit new 5-year lows during Asian trade. This morning's plunge feels similar to gold's bear-market lows of 15 years ago, epitomized of course by Gordon Brown's cack-handed sale of half the UK's reserves. Then it was the Swiss, now it's Chinese central bankers who don't have the confidence in gold which die-hard bulls were banking on. Switzerland in 1999 stunned the gold market by voting in a referendum to end the Franc's legal gold backing and cut the nation's gold reserves. Beijing in turn has now snubbed Western gold bugs in 2015. Or at least, it has disappointed those gold bulls who – amid a long decline from the crisis peaks of 2011 and 2012 – thought it would step in and reverse the bearish sentiment amongst Western money managers. No doubt a tidal wave of BS is building on the bug-o-sphere. Today's Western Kremlinologists...claiming to read the tea leaves of China's gold policy...really have some explaining to do. 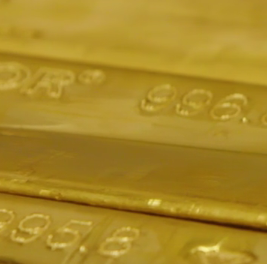 Beijing just revealed how much gold it bought. Time was, such moves were supposed to deliver the rapture of $5,000 gold. Yet prices have fallen instead, with a big spike down beneath $1100 per ounce touching the lowest Dollar level since March 2010 in Asian trade on Monday. The market, in short, is treating China's 604 tonnes of extra gold like the People's Bank was a heavy seller, not a buyer. That's because Beijing hasn't shown anything like the appetite for gold which some analysts and traders had expected, and which too many took for granted. Friday's news doesn't move China up the league table of central-bank gold holders. Its newly reported holdings of 1,658 tonnes are barely half the size of most analyst estimates, and leave it behind the big three Eurozone owners (Germany, Italy, France) as well as No.1, the US Treasury. China's official agencies also bought less gold than currency-crisis struck Russia since the People's Bank last revised its stated gold reserves in 2009. And on one key metric – diversification – the People's Bank of China may as well have not bothered. Six years ago, the new total of 1,054 tonnes equaled 1.5% of Beijing's huge foreign currency reserves. Latest data now put China's 1,658 tonnes at just 1.7% of its near-$4 trillion of FX reserves – a measly increase against the weight of gold bought. But while this moderate addition jars with what some Western bloggers and headline-chasers claimed (maybe a total holding of 3,000 tonnes...or 5,000 tonnes...maybe even 10,000 tonnes) it does fit what the People's Bank itself has said about buying gold. Perhaps the market should have listened to Beijing instead of Western guess-timates. "The capacity of the gold market is small compared with the scale of China's foreign exchange reserves. 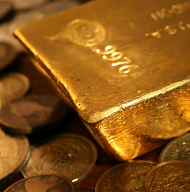 A large number of short-term transactions to buy gold could easily affect the market." That repeats what current deputy governor Yi Gang said as far back as 2010, not long after he became head of the State Administration of Foreign Exchange (SAFE), the agency which actually runs the government's FX operations – and which buys gold before it is moved to the central bank's ledger book in what now looks like a 7-year cycle. "If China purchases gold on a large scale, prices on the international market price will surge, which would, in turn, affect domestic individual consumers." "As it is, China has already become the world's largest gold producer, and is also a big consumer of gold, with an on-going policy of encouraging gold ownership by private individuals. 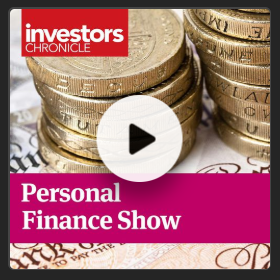 It's important to continue and consider the future of private investment demand as well as keeping international reserve asset allocation a flexible operation." Private gold demand, in other words, remains a key consideration for the People's Bank when deciding its own gold-buying activity. Politically, you might call this a kind of privatization perhaps...very gentle, and with the state growing its own involvement, but letting private citizens take the lion's share. Since the PBoC last changed its reported gold holdings in 2009, best estimates would suggest households and private investors bought almost 3 times as much as the state sector announced Friday – well over 4,800 tonnes. ...and it's not like the PBoC has never suggested it might trim official demand to let private individuals buy more cheaply, too. Such benign price controls sit nicely with the long-stated aims of "democratic dictatorship" and "socialism with Chinese characteristics". As we've suggested before, private and public gold holdings appear part of the same project – building the national reserves of what remains a one-party nation state. While China's private demand might be susceptible to a slowdown in GDP growth, the long-term outlook for the world's No.1 gold buying nation remains strong. But shorter term, market sentiment matters to prices, and sentiment had already turned bearish on gold, because traders are bullish on everything else. Two glimmers of hope for a near-term recovery in speculative attitudes. First, the drop in gold prices since 2011 didn't coincide with heavy Chinese central-bank buying on the international market. (Averaging just 8.1 tonnes per month since April 2009, the Chinese state's gold demand equaled barely 25% of the nation's world-leading mine output.) So the People's Bank isn't perhaps as impotent in pushing up prices as it appeared. That would only bode well, however, if the bureaucrats abandon their caution about driving up prices and hurting consumer demand, repeated again in Friday's statement. Second, these new multi-year lows in gold coincide with renewed bullish gains in other, typically better yielding assets. Gold's low point at the turn of this century coincided with the top of the Dot Com Bubble, and then with the peak hubris of policy-makers thinking they had abolished the boom-bust cycle (not to mention abolishing political strife too, just ahead of 9/11). The crashes which followed the Nasdaq and then the banking bubbles made gold uniquely appealing to savers and investors who had long forgotten they might need it. But pending the next turn of that wheel (it's always darkest just before going absolute pitch black, remember), policy makers look to be in the ascendent again, if not yet at the zenith. Yes, avoiding Grexit for another few months may seem small beer. But along with the apparent stability Beijing's own diktats have brought to the Shanghai stock market's 30% meltdown this summer, confidence in policy wonks is strong. Who needs gold? Technically, this drop could get worse as the summer wears on. The slide towards and below $1100 will only encourage more short selling – meaning bearish bets against gold made by hedge funds and other hot-money players in US derivatives contracts. No, those Comex futures and options contracts typically have nothing to do with physical metal. Fewer than 2% of New York gold futures have seen any metal delivered since the middle of 2013, down from a previous ceiling of 5% or so. Yet week-to-week, nothing is more closely correlated with Dollar gold prices than the size of the 'net speculative long' position, meaning the number of bullish bets minus the number of bearish bets made by traders outside the commercial gold industry. In the jargon of statisticians, r = 0.70 on average since 1995. Not even silver prices move that closely with gold (average r = 0.59 on weekly basis since 1995...and since Western price controls were lifted in 1968 in fact, as well). Fundamentally, major consumer markets like India are well-supplied for the summer shutdown of 2015, and demand will stay low until the Hindu wedding season returns, running towards the peak gold-buying festivals of Diwali and then the Chinese New Year. Mining supply meantime has yet to peak after the flood of new investment made during the bull market topped in 2011-2012. If you're looking for a floor, mining costs are actually falling. Odds are, they follow bullion-market prices anyway, and not the reverse. Add it all together, and Western savers now anxious about today's drop will regret not selling sooner. Even the $1 trillion gold crash of 2013 may now look an attractive exit point. But if you're concerned about your own position, then it's worth reviewing the reasons why you invested, and seeing if they still hold true. Big picture, China's gold buying remains phenomenal by any measure, with private-sector demand from households and investors almost six times heavier than the PBoC's purchases since the start of 2000. What that demand hasn't done, so far, is drive prices higher. Global interest rates have meantime never been lower, and central banks everywhere actually want to create inflation to try and juice economic growth. Quantitative easing, however, hasn't yet to boost prices anywhere outside financial markets. Credit growth is returning, but wage inflation remains AWOL in the rich West. Major debt defaults have so far been averted thanks only to untold guarantees from taxpayers, leaving the world's chronic imbalances between producers and consumers, exporters and importers to worsen yet further. Again, this all works fine, right up until it doesn't. Pending Armageddon however, gold continues to act as financial insurance for anyone holding a good spread of investments, rising when other assets perform badly, but falling when equities in particular do well. Like all insurance, that comes at a cost. 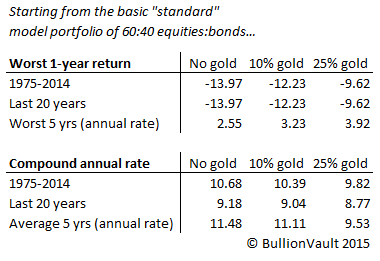 Buying gold has consistently reduced portfolio losses for UK and US investors over the last 40 years. But owning it will likely reduce your gains when other assets are out-performing. No, this isn't BullionVault's hard-sell. No one can deny that gold prices are down, costing some investors badly. 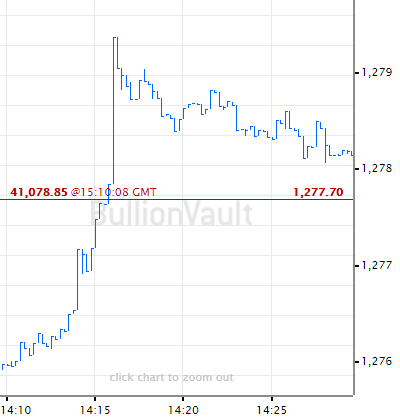 But on its own merits – rather than against over-excited 'analysis' of things which as yet have failed to boost prices – gold continues to do what it does, rising when you need it and slipping when the financial world thinks it's just a useless commodity. Against the backdrop of rising equities and recovering real estate, did anyone choosing to buy gold alone really expect the People's Bank of China to make them rich?